When my son was fifteen months old, I started introducing sensory bins and other forms of sensory play. I wasn’t sure what to expect and that was part of what led to my hesitation in starting with sensory play. I’m so glad that I introduced it though because it has been a big hit – the look on his face when I bring out a new activity is well worth any mess that may occur. I know that I was hesitant to introduce sensory bins because I wasn’t quite sure what to expect or how to contain the mess. 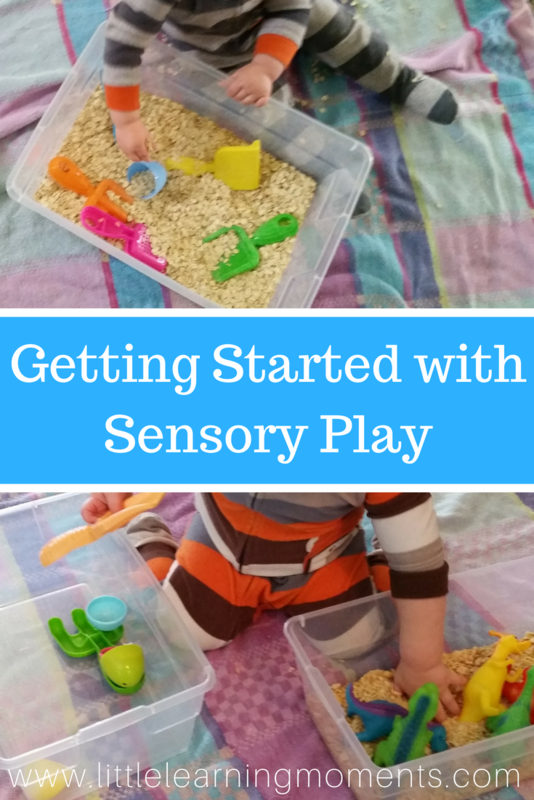 I’ve learned quite a few tricks in the past few months and thought I’d pass some of them along to you in this quick start guide to sensory play. First, let’s talk about the prep work involved in making sensory play a success. It can be as simple or as difficult as you make it. The big things that I would recommend considering are your child’s age and abilities. When we first started, I knew that my son was still in the “taste everything” mode. This played a part in choosing what to put as the base of my sensory bin. We started with oatmeal and it was quite successful. If you’re starting at an even younger age, then you might look into sensory bottles, bags, or boards. These all allow your baby to explore new textures without the risk of choking or eating something that they shouldn’t. Every child is different and it’s important to keep that in mind when you’re planning things. Keep it simple and on level with your child’s abilities. If you’re keeping things simple, then set up shouldn’t take a long time. Yes, there are many cute sensory bins that you can find on Pinterest that would take a little more prep work. Let’s place those in the “someday” pile for now though. Since we’re just getting started with sensory play, let’s keep it simple. Pick a container, filler, and a few toys. Put the container on the ground. To minimize mess, I recommend putting a tablecloth under your bin or even doing the activity outside if the weather is nice. Then, fill your bin with the item of your choice. Add a few toys and your bin is ready for playtime! This is the fun part! This is also the messy part! Your child has joined the fun now and is playing and exploring the materials that you’ve prepped. You have a few different roles during this part to help insure that this bin and future bins are a success. The first thing you should be doing is reinforcing any expectations. (Don’t expect things to go perfectly but still try to reinforce what you expect.) This could include keeping your child in the designated play space, preventing major spills, and encouraging them to play nicely. The second thing you could be doing is playing with your child. Use the toys and accessories to demonstrate how to play. Your child might not catch on right away and that’s okay – just keep trying. This is a great time to help them with pouring, scooping, burying things, and so many other skills. The final thing I recommend doing during sensory play is talking. Sensory play is a great time to build your child’s vocabulary. Talk about what they’re playing with and how they’re playing. Point out colors and shapes. Count with them. They might not join in right away, but you’re setting the foundation for new and exciting things in the future. If you’re starting sensory bins for the first time with an older child, then you’ll notice that their play and abilities will be quite different from that of a young toddler. You can still follow the tips in this section to extend their play and keep it from getting out of control and overwhelming. Let’s make clean up a breeze! I hope you listened when I said to put something under your bin. That’s the key to making clean up easy and stress free. I like to put all of the toys back in the bin before scooping up the tablecloth and pouring any oddball pieces into the bin. Then, I take the tablecloth outside and shake it off to get rid of any final pieces. After that, I put the lid on my bin and store it away for another day. (Depending on what’s inside of course.) If there’s a need, then I’ll run the dust buster or vacuum over the area where we were playing. 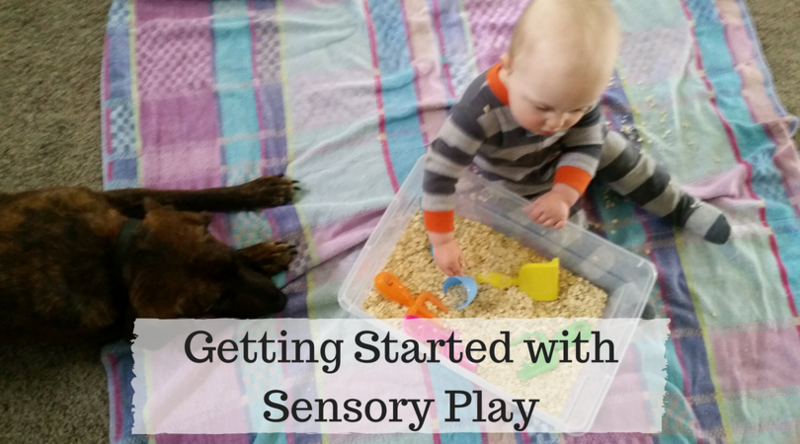 Now that you have a few secrets to successful sensory play, it’s time to get started! Take the tips I shared above and put together a new play experience for your little one! If you need even more guidance, I have a step-by-step guide to creating a water play experience in my free Facebook group. Feel free to hop in and download the file! The group is also a great place to connect, get new ideas, and share the fun things going on in your little one’s play world. Have a great sensory play experience that you’d love to share with me? Tell me about it in the comments below or tag me on Instagram with #littlelearningmoments.